Did you know that there is simple way to increase the effectiveness of your company and decrease both your and your customers' costs at the same time? Do you think that your customers would appreciate if they could call you directly from their web browser and did not even have to pay for the call? Do you think that your company could be able to outpace the competitors with such service? Then you are exactly at the right place. Ozeki provides you the solution for all above mentioned questions. It is called Ozeki MediaGateway SDK. This SDK provides all the support you need to improve your company with the most effective, most comfortable and most innovative communicational system, webphone technology (Figure 1). The webphone technology is a software solution that is embedded in a web site and can be used for basic communicational purposes. It can be a click-to-call solution that allows the web site visitor to call a preset number directly from the web browser. The phone will, of course, ring in your service desk office (or in any place you want). But the webphone provides more that only click-to-call voice communication. It can also be used for video phoning and it can be a fully featured softphone too that means the customer can dial more than one numbers from the web site (you can, of course limit the numbers that can be called). Now, you surely want to know what you need to do if you want to have one of these extraordinary communication softwares. Well, you will need to get Ozeki VoIP SIP SDK, make some basic settings, call some provided methods and voila, you will have your own webphone solution. You don't believe that it can be that simple? Read through the programming guides and believe your own eyes. This guide will show you how you can add your softphone to a web application, but if you want to know more about the possible solutions you can build with Ozeki VoIP SIP SDK, scroll down and check your possibilities at the Related Pages section. This guide assumes that you are familiar with the basic terms concerning webphone and softphone technology. If you have doubts about these topics, please check the sites listed in the Related Pages section before you read this article further. In order to make your programming work as simple as it can be, the example program of this article uses Ozeki VoIP SIP SDK, so if you do not want to write all the background methods that means codec support, transfer protocols, device drivers, etc. 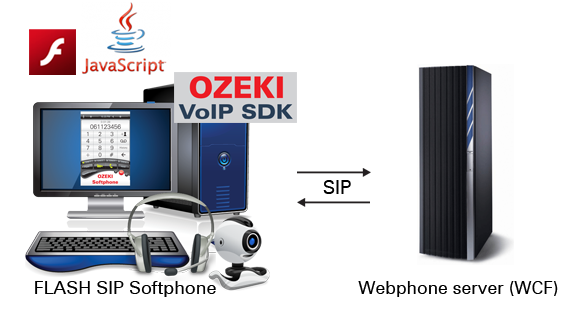 it is strongly recommended to get Ozeki VoIP SIP SDK before you start programming. The example program this guide introduces uses the extraordinary background support and tools provided by the Ozeki VoIP SIP SDK that is part of Ozeki VoIP SIP SDK. If you want to have a webphone or softphone solution that can be written this simply and can mean an innovative improvement for your company, you only need to get Ozeki VoIP SIP SDK now. Ozeki VoIP SIP SDK provides support for both client- and server-side webphone applications and as for the client-side it supports Silverlight and Flash solutions too. This guide will use the server-side SDK and the Flash client-side support, but the server can handle both Silverlight and Flash clients without any change in the code. In order to make your work even easier, you can use the same server you have written for the web to SIP communication earlier. This server is introduced in the Flash SIP softphone for web to SIP calls article. These above mentioned settings are essential to make before you start to build your client application. The Flash functions will be exactly the same as in case of the simple Flash softphone from the Flash SIP softphone for web to SIP calls article. The HTML is an easy-to-use language that you can use for GUI building too. Actually, you can build similar GUI solutions in HTML that you have created in Flash. If you read the next paragraphs carefully you will surely be able to build a softphone GUI similar to the one in Figure 2. A first, you will need to examine the GUI carefully and then you will see what structure you will need to build. The HTML will be interpreted in line order, so you need to define the GUI elements in the right order if you do not want to get some mixed-up layout. Figure 3 shows the basic structure of the softphone GUI. The HTML page you use here will use the same style sheet file (phone.css) as the one that was defined in the How to add a Silverlight SIP softphone to a web application article. You can define your own .css file with the settings you need. For example, if you do not like the color of the buttons on the softphone in Figure 2 you can set the background-color attribute of the .phoneButton element to the color you like. The structure Figure 3 shows can be directly written in HTML code. You will need to use nested HTML tags to define the containing connection between the GUI elements. Each boxes in Figure 3 represent a GUI element and the lines represent the connection between them. When a GUI element is connected to another that is left to it, it means that the GUI element should be defined in a nested HTML tag of the left one. The HTML code uses <div> tags for defining the GUI. The div classes and ids are got from the phone.css style sheet file. Code 4 contains the HTML code fort the softphone display that consists of three labels. You can see the nesting relation of the display and the labels. You can see that the text attributes can be modified within the label tag and the text itself will be written between the start and end tags. The softphone keypad contains the two function buttons for starting and ending a call and the numeric keypad with the numbers 0-9 and the * and # buttons. 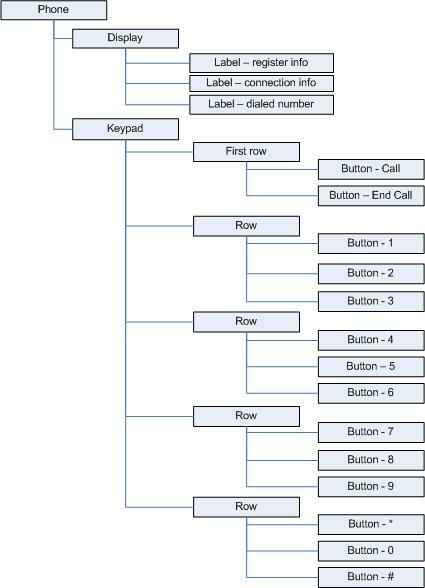 As you can read from the structure in Figure 3, the HTML code you should write will distinguish between the first keypad row that only contains two buttons and the next four rows that contain the numeric buttons. Code 5 shows the HTML definition of the first keypad row with the Call and End call buttons. Some attributes are set according to the phone.css but the definition also contains information about the EventHandler functions of the onclick event of the buttons. The numeric keypad contains four rows each with three buttons on it. Code 6 shows how a numeric keypad row can be defined in HTML. You can see that all buttons use the same EventHandler function with different parameters. The parameter is the number the button holds. 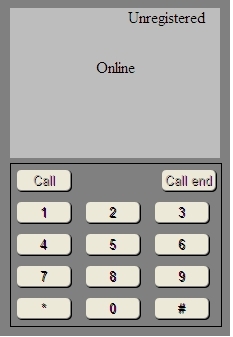 The keypad buttons' attributes all come from the phone.css, in this case all buttons are enabled so there is no need to set that attribute as enabled is the default value for the HTML buttons. The SetReadyStatus function (Code 9) modifies two labels on the GUI according to the information about the client that is ready for calls or not. It sets the info label and the client ID on the display. The UpdateInfo function modifies the info label on the softphone display according to the data it gets from the caller environment (Code 10). As you have seen in the HTML definition of the buttons, the numeric keypad buttons (including the * and # buttons) use the same EventHandler function. This function gets its parameter from the button's onclick event and only appends the pressed button's number to the dialed number that is shown on the display (Code 11). The dialed number label should be sometimes erased from the program. You could also put a new button onto the softphone GUI that erases this label but in this example the label will be set to empty in the background. The EventHandler for the Call button is shown in Code 13. This function calls the btnCall_Click function of the Flash program with the dialed number parameter that it got from the display. The End call button also needs and EventHandler. This function only calls the previously set EventHandler function of the Flash code (Code 14). In this example the GUI was built in HTML code instead of Flash so the functions of the previous Flash softphone have to be modified in some places. The modification will be needed where the Flash code referred to a GUI element. The easiest way to ensure that all the label modifications are changed in your Flash code is that you delete the GUI definition from the previously used Flash code. The only modifications you need to do is the label modifying calls and the settings for the callback functions that was mentioned before. If you have changed all the label modifying calls, your webphone is ready to use. Now, you are fully capable of writing a Flash softphone and adding it to a web application. Now, as you are fully familiar with all terms concerning webphones and softphones, you can explore the further extraordinary features of Ozeki VoIP SIP SDK to find the best solution for your communication related wishes.